Sometimes the actors in a film are more amusing to watch than the movie itself. Such is the case of Beauty Shop, the spin-off from the popular Barbershop movies. The actors in the film are much better than the story, which is thinner than aluminum foil. The concept was simple; take the straight no-nonsense talk of the men in Barbershop, and reverse the gender. Instead of guys, now it all women. There's even a white wannabe in the cast. 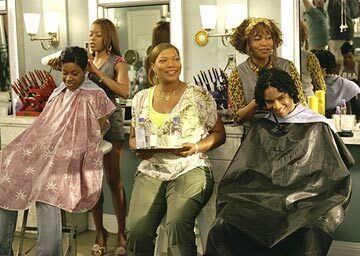 Barbershop 2 introduced Gina Norris (Queen Latifah, Taxi, The Cookout), and now Beauty Shop moves her to Atlanta, where she moved to give her daughter Vanessa (Paige Hurd, The Cat in the Hat, Cradle 2 the Grave) attends a prestigious school for the performing arts. Latifah is a wonderful actor that keeps getting better. It's sad that there is nothing in Beauty Shop that requires her to do anything more than be a nice motherly figure. She coasts by on her charisma alone. The story, by Elizabeth Hunter (The Fighting Temptations), Kate Lanier (Glitter, The Mod Squad), and Norman Vance, Jr. is basically Gina trying to open her shop, and all the frustrations that surround a jealous ex-employer and crazy employees and customers. There's no secret as to who the 'bad guy' is, how he/she is causing problems, and it's not hard to guess how everything will play out. The most disappointing aspect of this film is that it fails to be a raucous as Barbershop was. It seems very tame, and as a result, very boring. Director Bille Woodruff (Honey) uses a radio DJ (Adele Givens, The Players Club) to 'narrate' the film. She provides lots of voiceover, and is also the source of any potential straight-talk, with Gina and her beauticians typically listening to her on the radio and cheering her on. Again, the best elements of Beauty Shop are its cast. Kevin Bacon (In the Cut, The Woodsman) is hilarious playing against type as Jorge, a flamboyant Austrian. Gina quit after she got no respect from him, and now she's taking away his customers, including Terri (Andie MacDowell, Crush, Town & Country), who soon develops a hankering for collard greens, and a newly enhanced Joanne (Mena Suvari, Spun, Sonny). This annoys and worries Jorge, who does his best to undermine Gina. In another nice touch, Djimon Hounsou (Constantine, Tomb Raider: The Cradle of Life) for once, does not play some sort of stereotypical crazy/mad African/witch doctor/artist. He's a normal guy. Well, an electrician that plays the piano beautifully. Hounsou plays the romantic interest of Gina, and he does very well in a role that is not typical for him. There are some other colorful supporting characters, and some that are just walking stereotypes. Either way, one wishes that they at least had a better script to wander around in. 1 hour, 45 minutes, Rated PG-13 for sexual material, language, and brief drug references.